MW Mobile Blog: Papa and Jonah check out the new dock location. It wasn't as easy as it looks. It doesn't look easy but the outcome is clearly being enjoyed! oh my! you had to remove the winter dock from its location to accomplish this feat! That must have been a gross experience. loose any shoes in the quicksand? BTW how deep is it at the end of the dock? Which end? 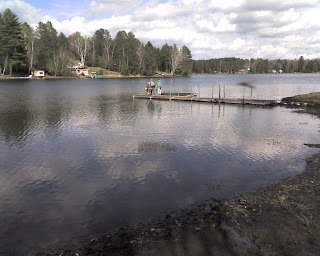 To give us the best chance of having a dock that a boat can use, I had to install the dock where there is a short swim to get to where the dock begins.